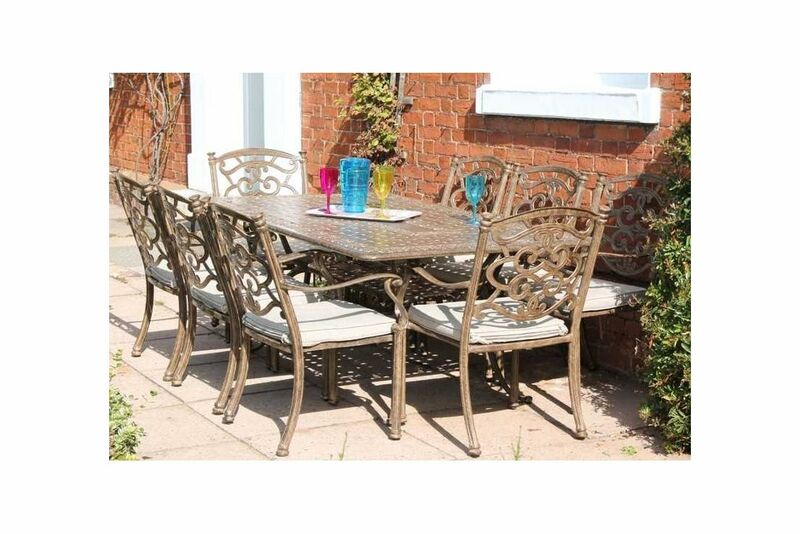 define our range of Aluminium Garden Furniture. round without being degraded by the weather. and the surface it rests on. The Large Rectangle table is ideal for out side dining. The casino table top has classical and concentric weave pattern. The set includes casino Dining chairs and a set of FREE beige coloured cushions. Ivycast uses high grade recycled aluminium for all cast and tubular aluminium products. Components are sand-cast or dye-cast depending on their structural need and complexity. Our tabletops are cast in one piece enabling us to produce smooth finished surfaces with concentric designs. The legs are then bolted to the tabletop in situ allowing us to deliver our largest product through a normal sized doorway. All our fixtures and fittings are zinc coated and none of our products are capable of rust. The table cast in one piece. The legs then bolt to the table top. This makes it possible to deliver large seater table through a standard size doorway. Coating REL-X uses the highest quality powder coating from the outdoor coatings specialist ‘Sherwin Williams’ in the USA, all coating are applied under strict adherence to their application procedure. Tables and chairs both have adjustable plastic feet that can be used to make an item level even on a wonky patio!